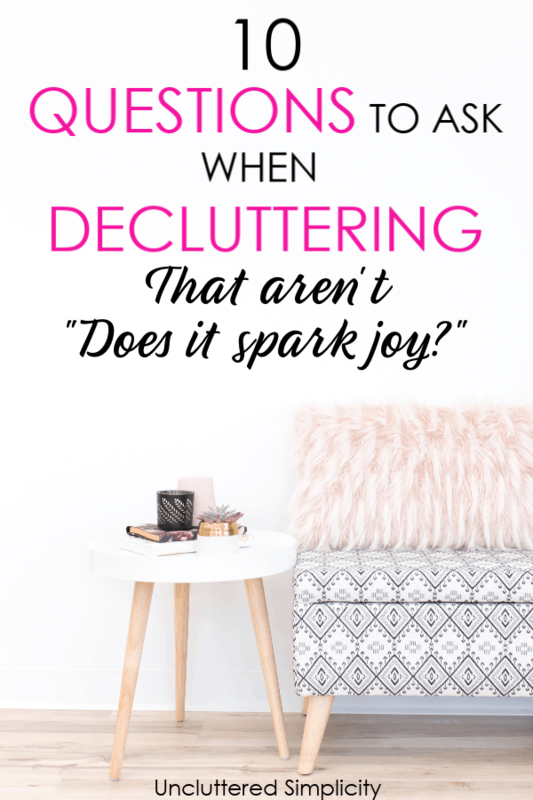 10 Questions To Ask When Decluttering That Aren't "Does It Spark Joy?" As you sort through your home looking for items to declutter, questions are bound to start flooding through your head. How do you know which items you should keep and which you should discard? What if “Does it spark joy?” just doesn’t cut it? I mean, can you honestly say that your toilet brush ‘sparks joy’? Here are 10 crucial questions to ask when decluttering that will help you make quick decisions about clutter. Clutter is simply delayed decisions. Let that thought sink in for a moment. If an item isn’t useful (to you), loved (by you), or something which you (currently) have space/time/resources to maintain, then it’s clutter. Period. Once you’ve made the decision to declutter and simplify your life, it’s far too easy to get stuck in the actual decluttering process. Especially if you have a lot of items to sort through and make decisions on. When deciding what to keep and/or discard, it helps to ask yourself the following questions. 1. Is this item a NEED or a WANT? If we listened to advertisers, EVERY helpful product would be considered a ‘need’. When someone is constantly whispering in your ear, “You NEED this!” It can be hard to discern whether something is a need or a want. These are the only things we really need in order to survive. However, I’m willing to bet you want to do more than just SURVIVE. Am I right? Why is why I don’t recommend you get rid of all of your worldly possessions and live a spartan lifestyle. Ultimately, we all want to be comfortable in our surroundings, to be able to pursue our passions, to explore our creativity, and to experience life with others. So, while you might not NEED an item, you may find that it still benefits and supports your current lifestyle in some way. If this is the case…KEEP IT! Remember: It’s okay to keep items you don’t necessarily need. As long as it is useful to you, loved by you, and you have space/time/resources available to maintain it. 2. Can I live comfortably without this item? I don’t know about you but I like a good challenge. Sometimes, I discover that life is miserable without certain items (A clothes dryer). Other times, I discover I can, in fact, live comfortably without a particular item (A hairdryer). 3. Does this item add value to my life? Another way to phrase this question is: Does this item support or detract from my version of an ideal lifestyle? If you have totes filled with long-forgotten crafts in various stages of completion, but you’d rather curl up with a good book than crochet, let them go. Still holding on to love letters from a relationship that went sour? Do I even need to say it? Additionally, when dealing with household decor, ask yourself whether the item fits in with the overall look/feel you want for your home. If it doesn’t, donate it. 4. When was the last time I used this item? Most organizing experts say if you haven’t used an item in the last six months, out it goes. However, last time I checked, Christmas only comes once a year. Therefore, I recommend a timeline of one year as a litmus test. If Christmas came and went this year and you didn’t break out the punch bowl, you can safely assume you probably won’t use it next year, either. 5. Would I buy this item again? This is one of my favorite questions to ask when decluttering because, not only does it help me take a long, hard look at where my money went, it also helps me curb future spending. Frequently, before purchasing an item I ask myself whether it’s something I am buying because it’s on sale, everybody else has it, or because it will truly serve a purpose in my life. The last thing I want is to wind up decluttering that same item six months down the road due to buyer’s remorse. 6. Do I have another item which will do the same job? When I was a kid one of my favorite tv shows was MacGyver. I loved the fact that he could take literally anything around him and turn it into something useful. The man was a walking Swiss Army Knife. I like to think he probably hated redundant items as much as I do and that he didn’t own any duplicates in his home. Because, if his favorite pen suddenly ran out of ink, he wouldn’t waste time digging around in a junk drawer for a subpar pen. Nope. He’d go to the kitchen, pulverize some berries, and voila…he’d have ink for his pen again. 7. Do I have the space to store this item? Time and time again I hear people complaining about not having enough space in their homes. When the fact of the matter is they simply have too much stuff. Seriously, why don’t we all (myself included) stop whining about the fact that our homes lack adequate storage and instead start decluttering our belongings based on the space we currently have available to us? Say you’re decluttering books and you only have one bookcase in your home. Limit yourself to keeping only those books which will comfortably fit on that single bookcase. Don’t go out and buy another bookcase so you can keep more books. Don’t box up extra books and ‘store’ them in the garage. Resist the temptation to come up with additional creative storage solutions just so you can keep more books. Don’t even get me started on off-site storage units. Ugh! Tip: This question in invaluable when it comes to kid clutter. 8. Do I have the time/energy/resources available to maintain this item? Every single thing we own costs money, time, and energy to maintain. Everyone has the same 24-hours in a day, finite energy, and limited funds. When deciding which items in your home to declutter ask yourself if you really want to spend another minute cleaning/maintaining/storing it. If it broke tomorrow, would you have the money to fix or replace it? Is it worth the mental energy you spend each day fretting about where to keep it? Think of your home as an exclusive club. The items in it must fulfill certain requirements in order to maintain their membership. They must pay their dues. If an item in your home isn’t living up to your expectations, revoke its membership. Declutter it. 9. Is there someone else who would benefit from this item more than I do? In his book, “The Minimalist Home” Joshua Becker recounts the story of a woman who loved fashion and struggled to declutter her clothing despite the fact that she knew, deep down, she owned far too many clothes. One day, while driving to work, she noticed a battered women’s shelter. Surprisingly, despite the fact that she took the same route every day, she had never noticed it before. She started thinking about the women inside. How many of them were forced to leave home with only the clothes on their backs? Now, they would need to find employment in order to support themselves and their families. She thought about how she felt when she was dressed for the day in quality, fashionable clothes and she wanted the women living in the shelter to experience the same joy and confidence. 10. What is the REAL reason I am holding on to this item? Why, oh why do we keep stuff we don’t use, love, or need? Just in case (aka What if I need it someday? )- Realize that ‘someday’ may never come and if it does, you can likely borrow the item from someone else or rent it. Out of fear- Ultimately, it is fear which holds us back and keeps us trapped in a poverty mindset. We worry (needlessly) that we couldn’t afford to replace something if it were to break, so we hold onto all the things. The reality is, if we can’t afford to replace something, maybe we can just do without it. Out of guilt from the money spent on the item. Or out of guilt (perceived or real) because it was passed down- give yourself permission to declutter your family heirlooms and remember that you can’t get the money you’ve spent back. Release yourself from the guilt you may be experiencing. Sentimental reasons- Set physical space limits for sentimental items. Such as a keepsake box, single cabinet, or a designated space in your closet. Once it’s full, you’ll need to make tough decisions on which items to let go of. Remember, if everything you own holds sentimental value, then nothing is truly special. To fill up space- Believe it or not, sometimes we keep things simply because they cover a wall or fill a corner. I am here to tell you, blank space can be a good thing! It gives your eyes (and brain) a place to rest. Start by setting aside a single wall in your home and designate it a ‘blank canvas’. Resist the urge to fill it. Unrealistic expectations- Oftentimes, we keep stuff we don’t use because it represents the person we want to be. Not the person we currently are. Be honest with yourself and only keep items that support or enhance your present season of life. Mental illness- Such as anxiety, depression, hoarding, compulsive shopping. If this is the case, PLEASE seek help from a medical professional! Can I borrow it if I need it again? Would I be devastated if it was damaged or lost? Is this something I want my children to see one day? Can it be replaced inexpensively if I need it again? But then, what fun would that be?